It’s one of those oxymorons of horse training that in order to make our horses straight, we make our horses bend. Let’s leave for a later post the question of what straight actually means, since straightness varies depending on the level of education of horse (and rider). For today, let’s stay with the basic working definition of a “straight horse” — a horse that moves without favoring one side (or one direction) or another. 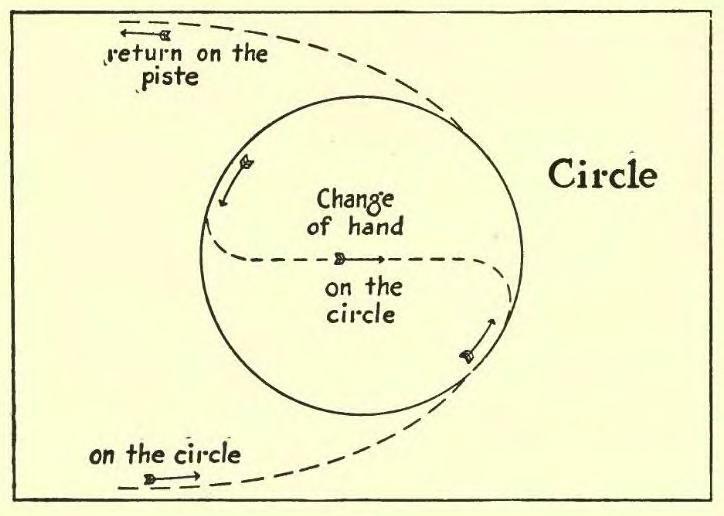 We start working on making the “bad direction” as good as the “good direction” by riding our horses along curved lines — in circles, serpentines, bending lines, shallow loops, etc. Most of us are also taught that the best way to bend our horses is with diagonal aids — the oft-repeated “inside leg to outside rein.” While this orchestration of aids is extremely effective, it requires knowledge on the part of the horse, and independent aids on the part of the rider. This is part of the reason it so often fails. Anyone who doubts its failure must have been blessed by not having to hear trainers shouting the words “OUTSIDE REIN!” or “INSIDE LEG TO OUTSIDE REIN!” repeatedly across the arena to mystified, frustrated riders and their counterbent and equally frustrated horses. For “inside leg to outside rein” to be effective, the horse must be responsive to the aids. He must be supple enough to be able to bend and not brace, and must understand the use of the outside rein as a “bearing rein” or “neck rein” (sometimes also known as a western rein or supporting rein). 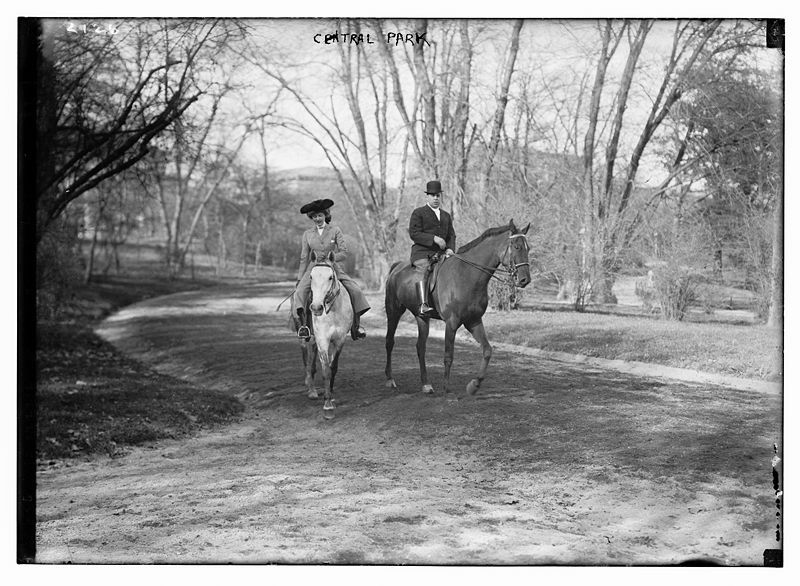 The lady on the grey horse is using an outside bearing rein to turn her horse to the right. Now doesn’t that look easy? It’s not. But see the happy horse? For a rider to properly apply “inside leg to outside rein,” he must have independent aids. Part of being “right handed” or “left handed” means that strength and nimbleness tend to align on one side of the body. Riders must overcome this “handedness” in order to effectively apply diagonal aids. You can easily apply the diagonal aids if you can move the shoulders of the horse independent of the haunches and the haunches independent of the shoulders. Tests of this ability are the turn on the forehand and the turn on the haunches (actually, these days, the true test is a pirouette since the turn on the haunches is no longer synonymous with a pirouette and provides for forward movement). 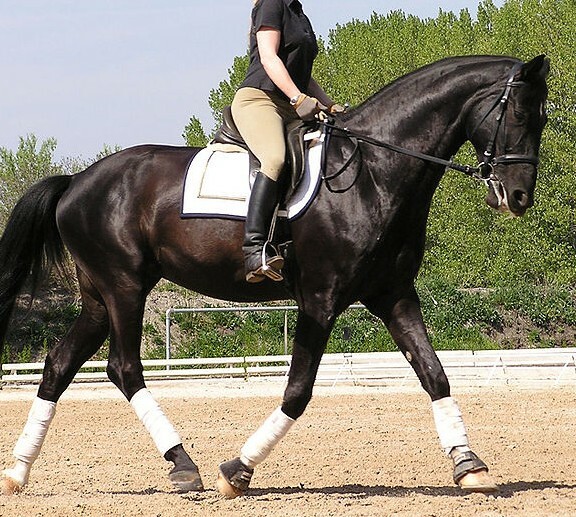 If your horse can’t execute at least a quarter pirouette, your horse isn’t yet sufficiently trained or supple to comply with the diagonal aids, or your aids are not yet refined enough to be able to transmit diagonal aids clearly to the horse. 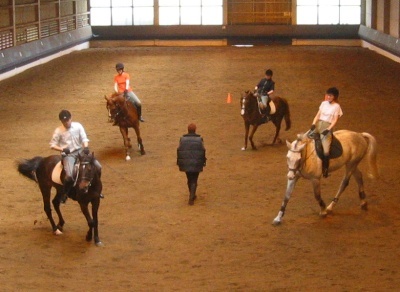 When riders have difficulty isolating diagonal aids (right hand/left leg or left hand/right leg) and horses have difficulty understanding, riders instinctively try harder. Trying harder is a good thing, but applying stronger aids is generally a bad thing. Does this sound familiar to you or your students — as the stronger inside leg is applied, the rider tends to draw the knee and thigh up, and to compensate for this by lowering the inside shoulder and collapsing at the waist…or the rider draws the inside leg back, which throws the haunches to the outside and makes the horse fall in on the circle…or, in desperation, the rider applies the heel or holds the aid, and teaches the horse to ignore it all? Unfortunately, since this is an ineffective rein aid for sideways movement if combined with a restricting inside hand and inside leg, the rider tends to strengthen the aid by pulling back (which makes the horse brace even more). Often, the horse responds to this pulling outside rein by turning towards the outside, so the rider corrects the developing counterbend with an even stronger inside rein (defeating the entire purpose of the outside rein) and/or inside leg. All this tends to make the rider’s weight shift to the inside, and the horse attempts to balance that weight by moving his own weight towards the inside. What has happened? The rider’s body has succeeded in telling the horse to bend in exactly the opposite direction of what is desired. Why do the same aids work in the horse’s good direction, then? They don’t. It’s an illusion that they work. It’s simply easier for the horse to bend in that direction, despite everything that the rider is doing wrong. Luckily, it’s infinitely easier to bend your horse with your eyes and belly button (and a little flexion of the jaw) than to use brute strength. Or you can use Buck Brannaman’s methods, which have been on my mind lately. More on that in another post. I wonder if the instructors who keep repeating that mantra like a recording really know how it works? Due to bad trainers I’ve made this direct rein mistake that you describe and got nothing but frustration out of it. Hi Shannon — You’re not alone in being frustrated and misdirected during this exercise. It’s exactly the problems you and so many other riders encounter while trying to perfect “inside leg to outside rein” that led me to write this post. I like the simplicity of “inside leg holds the bend and outside rein moves the shoulder.” But for that to be successful, the rider must be able to effectively apply the aids and the horse must understand them. As you know, I often say “inside rein asks for flexion, outside rein holds the bend.” Once the horse is supple, the hind end naturally follows the front end. Just to be clear (to me anyway) you are saying that both the inside leg and the outside rein hold the bend. So while it is true that they are “held,” in that you don’t do something different with them, it should not be necessary, riding a well trained horse, for the aids to be applied in order to “hold” the horse in a certain position. Once the horse has given what you asked for, your aids should soften but remain in the same position. The horse should carry himself (that famous “self carriage”), until you alter your aids to ask for something new. Does that clarify? And make sense? Katie, Sorry to have taken so long to respond, but this is a perplexing and fundamental issue for many riders to understand if they have not been successful in feeling it first. My confusion lies in reading your post to Shannon on August 20 where you say “I like the simplicity of “inside leg holds the bend and outside rein moves [ie flexes] the shoulder.” But for that to be successful, the rider must be able to effectively apply the aids and the horse must understand them. First of all, it’s important for me to say that you are completely right that flexion and holding a bend are very different. And before we go on, I think it might help to talk a little bit about how they’re different. I know I’m overdue for a post talking about flexion, and for that I apologize, but the signs of flexion are a horse that provides no resistance to the hand, who easily moves the head, releases the back and often at first, moves the jaw in a slight chewing motion, providing salivation that wets the bit (this increasing the sensitivity of the communication) and makes a slight white “lipstick” that is visible on the outside of the mouth. Once we have flexion, the inside hand goes back to neutral. It does not hold anything. The inside leg can come into play on a horse that knows the diagonal aids and a rider that can apply then well, asking for a little more bend. On a horse that doesn’t yet know the diagonal aids or a rider who hasn’t yet developed independent aids, simply asking for flexion keeps the horse from moving around the circle like a board, because, as we’ve said, flexion releases the head from the spine from the back. So this is all a long (probably way too long!) way of saying that the inside rein asks for flexion and the outside rein moves the shoulder and keeps it in place along the line of the circle. There was certainly some “short hand” in my response to Shannon, who has been my student, so she knew exactly what I was saying, but understandably, it confused the issue. I hope that this clarifies, but I’m happy to continue the discussion. And I don’t want to sign off here without the reminder not to forget your belly button! Hi Debby – Ah yes, the broken body and the strong mind! I think that sometimes we riders make it harder on ourselves — and certainly on our horses — than it has to be. Yes, it is difficult to be balanced and tactful and to apply our aids and wait for a response…and most of all, perhaps, to understand that our horses must learn a new and foreign language from us, and it is our goal to make that process of learning not only simple and straightforward but also kind. So often if we don’t push and fight and just try to understand how to better communicate with our horses instead, we find that — miraculously! — they can do what we thought they couldn’t or wouldn’t. Helping riders achieve that goal is what brings me such tremendous joy as an instructor. Thanks for your contributions to the discussion!